Of all the cosmic forces in the Marvel Universe, none are more terrifying than the Dark Phoenix. Sure, Galactus might show up and devour your planet, but he's a force of nature who's simply feeding to survive. The Dark Phoenix, on the other hand, is the kind of uncontrollable destructive force that will take over a person's life and form, then destroy an entire solar system just for fun. But like all the best villains, her actual story is a little more complicated than that. From her beginnings as an upgrade to Marvel Girl's middling telekinetic powers to the planet-shattering epic that was the Dark Phoenix Saga, all the way to her death, resurrection, death, resurrection, death, and resurrection again, the story of the Dark Phoenix weaves its way through plenty of strange incarnations and last-minute changes. She is fire, she is life incarnate, and this is the truth behind the X-Men's most devastating foe. 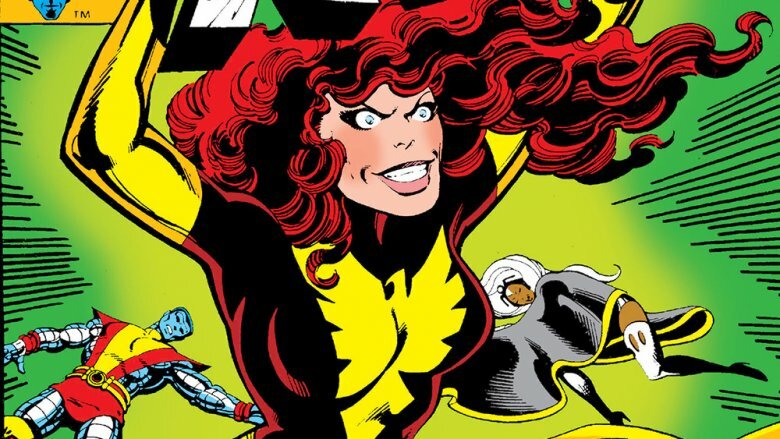 The character who would eventually become the Dark Phoenix has a long history with the X-Men. In fact, it goes all the way back to the team's debut in 1963, when Jean Grey became the last student to join Professor Xavier's original student body (and masked paramilitary strike force) in X-Men #1 as the telekinetic Marvel Girl. While the original X-Men stories certainly had their charm, they certainly weren't Stan Lee and Jack Kirby's finest work. Instead, it reads more like their attempt to put a slightly new spin on the formula they'd already used a great deal with Fantastic Four, something that's readily apparent in the comparisons between Jean and Susan Storm, the Invisible Girl. Like Sue, Jean was the only woman on the team, and both characters were also the subject of a few love triangles — although it's worth noting that Cyclops and the Angel's good-natured romantic rivalry was a little more like something you'd see in Archie than the stories where Sue was captured by a fish-man who tried to conquer New York with an army of Atlantean submarines. 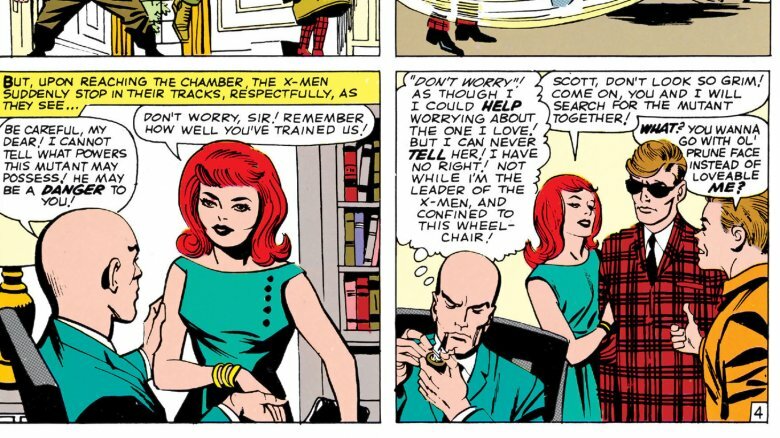 There was, however, that one scene in X-Men #4 when Professor X claimed he was in love with his young student, but no one wants to talk about that, even the comics themselves. In an interesting bit of parallel storytelling, both characters would also experience exponential increases in power and be the subjects of storylines where they were taken over by evil personalities, although it's fair to say that the Dark Phoenix Saga was slightly more popular than Sue's brief turn as Malice. It's not exactly a coincidence, though — both of those stories involved artist and writer John Byrne. 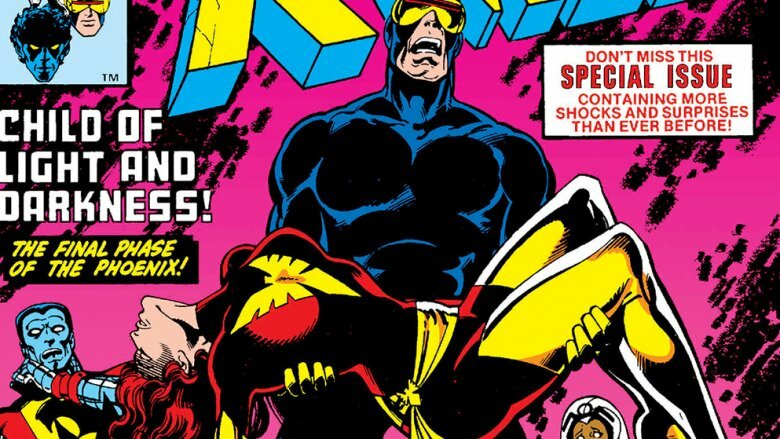 By the '70s, the X-Men had all but collapsed. The core title had shifted to being a bimonthly book that wasn't even printing new stories, and even the characters had wandered off into different books. All that changed, however, when Len Wein and Dave Cockrum made a last-ditch effort to grab new readers with a rebooted team that debuted in Giant-Size X-Men #1. With Beast in the Avengers and Iceman and the Angel off wandering into a short-lived team called the Champions, the new team introduced some international flavor with a handful of new characters that Cockrum had drawn up as potential members of DC's Legion of Super-Heroes, and an obscure Canadian superhero that Wein had co-created for an issue of Incredible Hulk, anchored by the two X-Men who were too tied in with the team to be moved elsewhere. It was a desperation move, but it absolutely paid off. Those new characters, who continued in new stories starting in X-Men #94 with new writer Chris Claremont, included Storm, Nightcrawler, and Colossus, and that Canadian Hulk foe was an extremely obscure character that you might've heard of called Wolverine. The two existing X-Men, of course, were Cyclops and Marvel Girl, who would quickly get a new codename. When the all-new, all-different X-Men went to orbit for a battle against the Sentinels and a team of robotic duplicates of the original team, the shuttle they were using to return to Earth was fatally flawed. Jean took the controls, attempting to shield herself with a telekinetic screen, but the heat and cosmic radiation overwhelmed her, and caused a huge change. When she the shuttle crashed in Jamaica Bay, Jean emerged with a new costume and an incredible new level of power, declaring herself to be "life incarnate, now and forever, the Phoenix." And that's about where things start to get a little confusing. This might come as a surprise, but it turns out that recovering from a near-death experience with cosmic radiation and emerging with incalculable power isn't always something that works out well for everyone involved. For Jean Grey, it started off well enough, with her new powers — including the ability to telekinetically manipulate objects right down to the molecular level — even allowing her to hold back Cyclops's optic blasts so he could look at her without his visor. 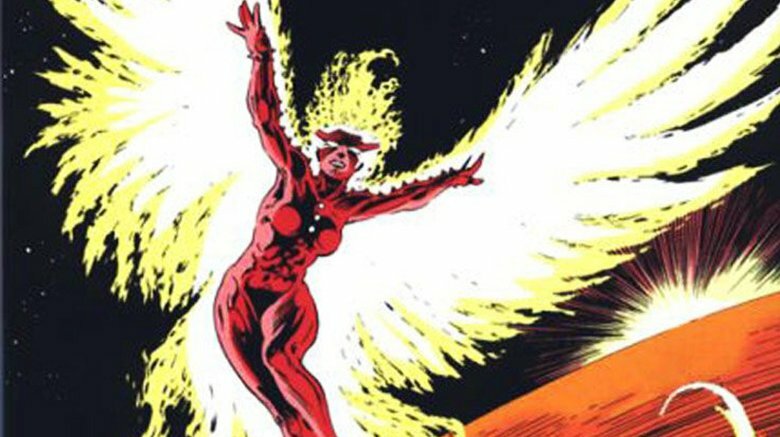 Unfortunately, the Phoenix's power was often physically overwhelming for Jean, and things only got worse when she was targeted by the Hellfire Club. 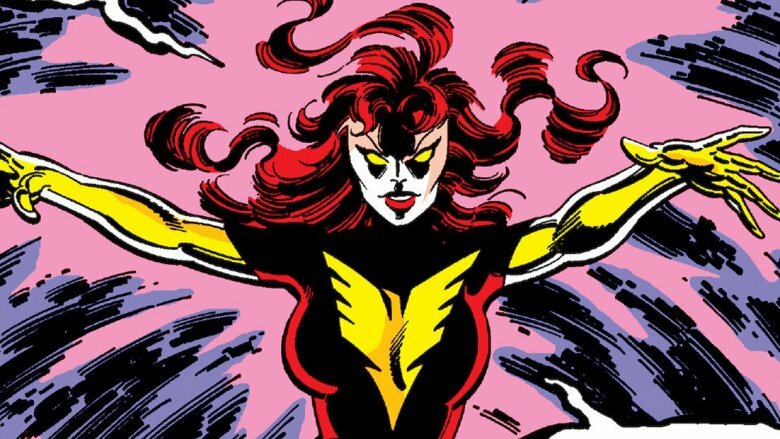 With a psychic villain called Mastermind manipulating her, Jean found herself overwhelmed by a darker side of her personality: the Dark Phoenix. As a being of pure, destructive, cosmic fire, the Dark Phoenix's first act in Clarmeont and Byrne's Uncanny X-Men #135 was to head out into deep space and consume an entire star, causing it to go supernova and destroy an inhabited planet, burning all of its 5,000,000,000 inhabitants alive in an instant. The destruction of an entire planet caught the attention of the alien Shi'ar Empire, who quickly arrived to put Jean on trial. It was revealed that the Phoenix Force was an alien entity that had bonded with Jean, but despite the X-Men's arguments that it was the Dark Phoenix, not their friend, who had, you know, committed genocide, the Shi'ar disagreed. After a trial by combat on the Moon, Jean sacrificed her own life, bringing the Phoenix Saga to an end. …except that wasn't how it was supposed to end at all. When Chris Claremont and John Byrne were plotting the finale of the Dark Phoenix Saga, the original idea was that Jean would have her memories erased and the power of the Phoenix locked away permanently — or as permanent as anything is in superhero comics, anyway. 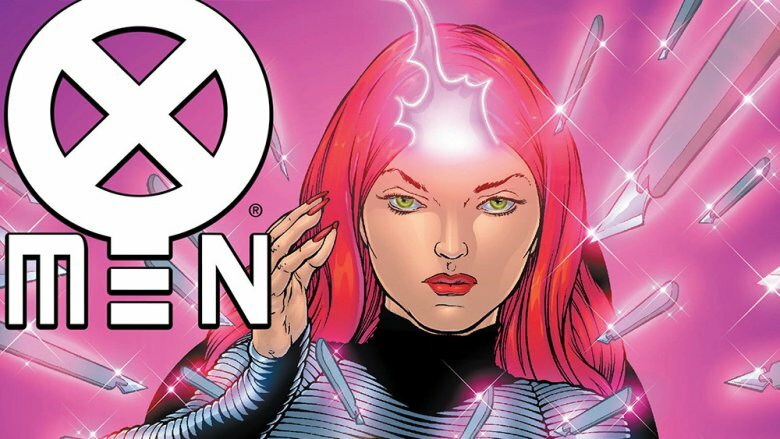 Without the cosmic entity possessing her, Jean would return to the X-Men, and the story would move on. Jim Shooter, Marvel's iron-fisted editor-in-chief, did not approve. "That, to me, would be like taking the German army away from from Hitler and letting him go back to governing Germany," wrote Shooter in 2012. Jean, in one form or another, had callously murdered 5,000,000,000 people, and there was no way that Shooter was going to let her just go "back to living at the Mansion, hanging around with Storm and company" after that. He insisted that Jean had to be punished for her crimes, and when Claremont said that the X-Men would never stop trying to break her out of space-jail and that the only way to move the story forward was to kill her off, Shooter called his bluff and agreed. Claremont and Byrne did exactly that in Uncanny X-Men #137, which became an instant classic and is often regarded as the high point of the entire X-Men franchise. And just to make sure everyone knew what was happening, that issue bore Shooter's edict as a cover blurb: "Phoenix must die!" …except that it was only the Phoenix who died in X-Men #137. It turned out Jean Grey was just fine. With Shooter's edict preventing Jean from ever returning from the dead to rejoin the X-Men, John Byrne figured out a way around it. It wasn't Jean who was the problem, it was the Phoenix, so in 1986's Fantastic Four #286 — a pretty unexpected place for an X-Men character to come back — Byrne told the story of how the real Jean Grey was never actually possessed by the Phoenix. Instead, it turned out that the Phoenix was a completely separate being who had been drawn to Jean by her considerable but untapped psychic power, took her form and memories as its own, and encased the original Jean in a "healing cocoon" at the bottom of the bay back in X-Men #101, published ten years earlier. When the real Jean was discovered, the FF were able to conclusively determine that she was completely innocent of any interplanetary crimes that may have been committed by her doppelgänger. 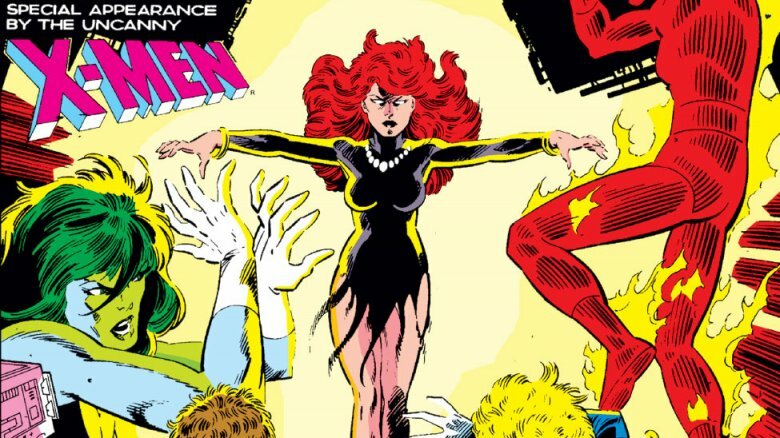 The Phoenix's cocoon had healed her from the space shuttle crash, leaving her free to reunite with the other four original X-Men as a new team in the pages of X-Factor. What if the Phoenix had lived? …but maybe it could've happened like this instead. 1991's What If #32 asked the question "What if the Phoenix had lived?" That story explored Claremont and Byrne's original idea of having Jean subjected to a "psychic lobotomy" at the climax of the Dark Phoenix Saga, and returned to Earth. The problem was that, as Byrne had revealed in FF, that wasn't Jean at all, just a cosmically powered doppelgänger who had fooled even itself into believing it was the real Jean Grey. Needless to say, the procedure wasn't permanent, although it lasted long enough for her and Scott to get married and have a child called Rachel. When "Jean" was attacked and gunned down by Mastermind and the Shadow King, a perennial X-Men villain with a tendency to possess bodies, her cosmic abilities kicked in, resurrecting her as the Phoenix with the full knowledge of who and what she was. The sudden knowledge led her to destroy the real Jean's body and attempt to make the world better by brainwashing the rabidly anti-mutant Senator Robert Kelly into a more tolerant views. Unfortunately, that gets him assassinated, and ushers in the dystopian future of Uncanny X-Men #141's "Days of Future Past," where superpowers are outlawed and the world is taken over by the Sentinels. This time around, though, the Sentinels wind up having to deal with the Phoenix, who, after debating whether she should even be involved in this mess, decides to vaporize the robots before heading out to the stars, leaving Cyclops on Earth to raise Rachel, who it turns out is half-space-god. Good thing that didn't happen! …except that the part with Rachel actually did. Sort of. If you're familiar with the X-Men at all, then you probably already know that those stories are chock full of refugees from dark futures where things have gone horribly wrong. Cable, Bishop, X-Man, and, of course, Rachel Summers, the second Marvel heroine to use the codename Phoenix. Unlike her What If counterpart, this version of Rachel hailed from an alternate universe where the Phoenix actually did bond with Jean Grey, making her only a quarter space-god. That is, as you might guess, still pretty phenomenally powerful, and led the authorities in her dystopian reality to use her as a "hound," psychically hunting down other mutants before she found herself transplanted to the core timeline, where she'd fight the good fight alongside the UK-based team called Excalibur. Her ability to tap into the Phoenix Force did not go unnoticed by the Shi'ar Empire. In an effort to keep the Phoenix from rising again — good luck with that, considering the name — the Empire wiped out Jean's entire family and attempted to do the same with Rachel, sending her on a path of space-revenge. More recently, she's opted for a relatively low profile, taking the name Prestige instead. Which, not coincidentally, made way for Jean to return from the dead as the Phoenix in late 2017. 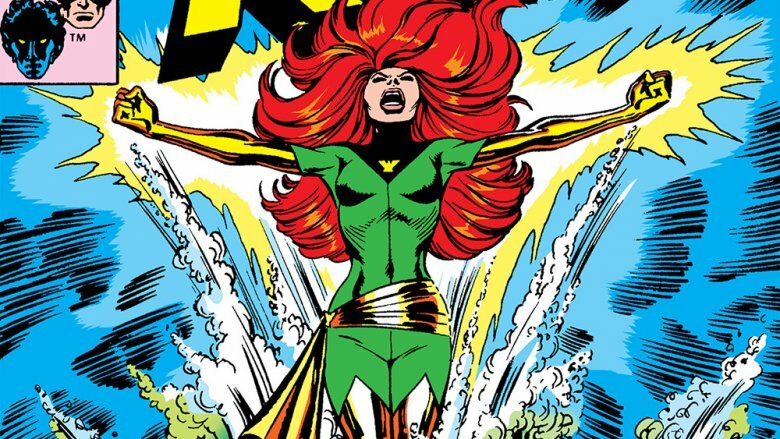 After years of using "Jean Grey" as both her real name and her superheroic identity for most of the '90s, the turn of the century saw Jean re-embracing the name Phoenix and tapping into its limitless power. In 2002's New X-Men #128, it was revealed that containing Charles Xavier's mind within her own had pushed Jean past her limits and woken the force within her, leading to a scene where the Phoenix took over and claimed "Jean is just the house where I live." As sinister as it might sound, the Phoenix was relatively benign this time around. Jean never fully lost control, and was able to use the Phoenix powers to save Xavier from being assassinated by the always-troublemaking Shi'ar Empire. Unfortunately, a phoenix is literally defined by its ability to rise from the dead, and that means having to die. When she and Wolverine were trapped on a space station crashing into the sun, Wolverine popped his claws and "killed" Jean in order to spare her the pain of burning to death. Instead, this woke the full Phoenix consciousness, which resurrected Jean once again just long enough for her and Wolverine to make it back to Earth for a fight with Magneto — or at least a doppelgänger that was claiming to be Magneto, as revealed a few months later when Chris Claremont decided that he didn't like the way Magneto had been characterized in that story. 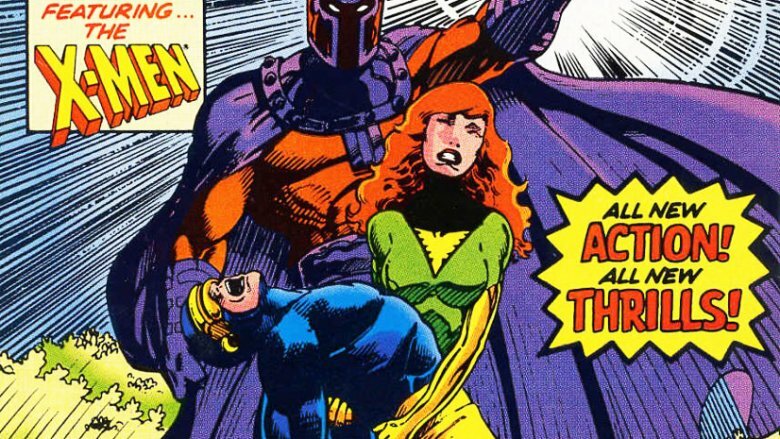 Either way, "Magneto" had enough power to give the Phoenix a "cosmic stroke," killing Jean once and for all… for about 13 years. When it comes to comic book deaths, that's basically an eternity. In the early '80s, the two most popular comics on the stands were Marvel's Uncanny X-Men and DC's New Teen Titans. Both books were built around the idea of blending soap operatic drama and high-action superheroics with a young cast, and both would make their creative teams superstars — Titans ' Marv Wolfman and George Pérez would even get the job of destroying and rebuilding the entire DC Universe with Crisis On Infinite Earths in 1986. Clearly, these books were just asking for a team-up, and in 1982's Uncanny X-Men and the New Teen Titans, Chris Claremont and the legendary Walt Simonson delivered what might be the best possible version of that idea. 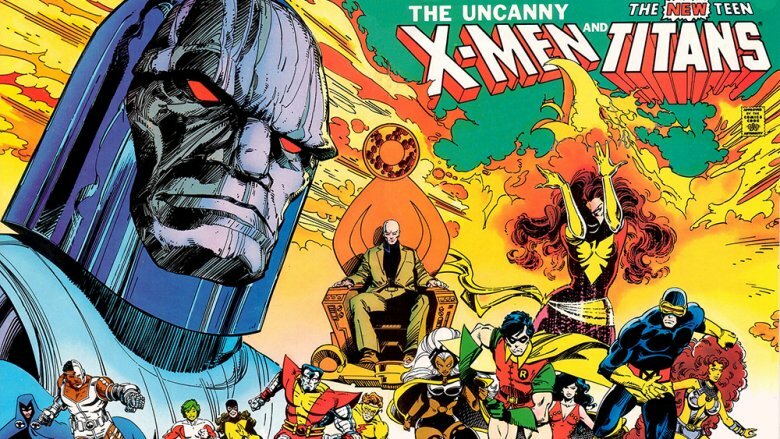 There's a crowd-pleasing bit where the X-Men take on the Titans' arch-nemesis, Deathstroke the Terminator, but the main plot involves Darkseid, DC's heavy-hitting god of evil, resurrecting the Dark Phoenix by creating a manifestation of her pulled from the X-Men's memories. His plan is to use the Phoenix to destroy Earth, but just like the real Phoenix, Darkseid's manifestation had a connection to Cyclops that allowed her to overcome her destructive nature. Realizing she'd been manipulated into evil, the Dark Phoenix transferred her power to Cyclops, who obliterated Darkseid with a cosmic-powered optic blast that took the form of a gigantic fiery bird exploding out of his eyes. And yes, it is as awesome as it sounds. It turns out that giving other characters Phoenix powers can create some pretty memorable moments. In 2012, a bunch of other characters got Phoenix powers, but sadly didn't create any moments as memorable as a dude shooting a giant laser fire bird out of his own face. In Avengers vs. X-Men, the Phoenix Force lived up to its name by returning once again, leaving a path of destruction in its wake as it came to Earth in search of a new host. The Avengers tried to stop it, but Iron Man's attempt to destroy it wound up splitting it into five pieces, meaning that instead of dealing with one Phoenix with infinite cosmic power, Earth had to contend with five Phoenices, each with 20 percent of infinite cosmic power. If you note that 20 percent of infinity is still infinity, you'll understand why this was a pretty big problem. 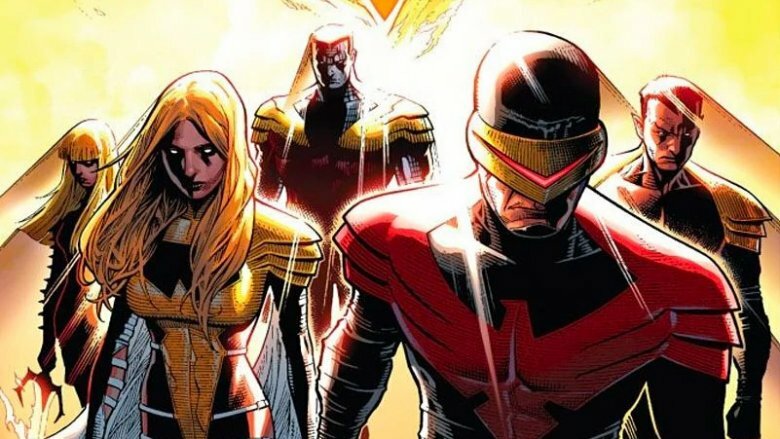 The hosts, known as the Phoenix Five, were Cyclops, Emma Frost, Colossus, Magik, and Namor, the Sub-Mariner. They quickly took over the world and created exactly the kind of dictatorial utopia that superheroes tend to rebel against, leading to the Phoenix Force consolidating within Cyclops, briefly turning him into the Dark Phoenix, before it was finally drawn out and used to restore the mutants. With that, it vanished again, presumably gathering its strength to resurrect Jean Grey one more time.